London - She's refusing to enter the Royal Box on Sunday amid predictions of a national humiliation as Roger Federer wipes the floor with Andy Murray. Besides, three hours of sitting around on one's royal arse plays havoc with the old colostomy bag. "Best send Wills, Harry and new gal Kate," a Palace lackey advised today. "Then when Murray collapses is a 6-0 6-0 6-0 thrashing it won't be YOU who gets papped with that loser Scot." Sunday's 2pm London start time also happens to coincide with some dreadful astrological stuff all over Finals challenger Andy Murray's natal chart. 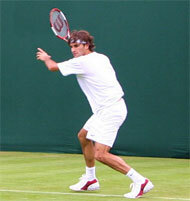 But the same aspects merely energise six times Wimbledon Champion Roger Federer's own stars. Tonight those prognostications have been horribly exacerbated by media reports that 'Sunday blues start at 4.13pm according to survey'. The odds of Roger Federer swooping to a straight sets win over Andy Murray are now best-priced at 1-3FAV.